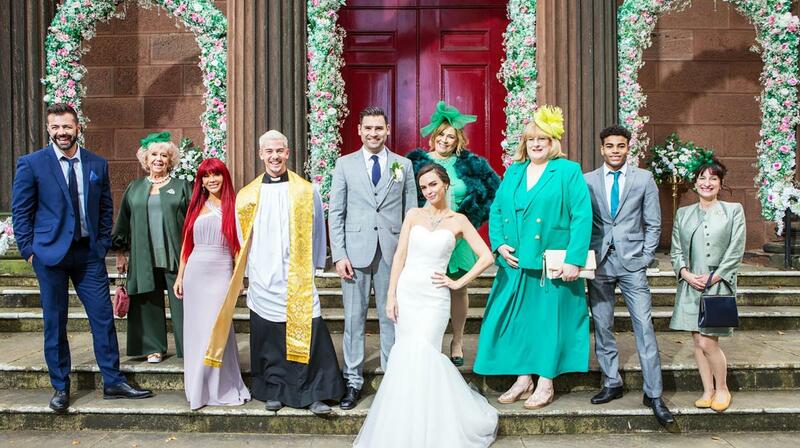 #JonnOnTV: Hollyoaks: will Russ and Mercedes get married? Goldie and Sylver McQueen are supporting Mercedes on her big day, but will either of them cause any trouble? The family went to Magaluf this summer for Mercedes' hen do, and ex-convict Sylver was finally reunited with first love… the bride to be. After she had a row with Russ, Sylver and Mercedes ended up sleeping together. They've managed to keep it secret for months, but there is no denying the chemistry between the pair. More recently, Goldie discovered the affair and told Russ the truth, only to feel guilty about upsetting her brother, forcing her to take it back. Russ is insecure and doesn't know what to think, and in the heat of the moment, sleeps with Goldie... and gets her pregnant! He freaks out once he discovers the news and persuades her to have an abortion. Mercedes is determined to find out who knocked up her little cousin, and Goldie uses Joel as a scapegoat for the baby daddy. It's the big day, Mercedes is determined to make this wedding the best one yet… unfortunately it's off to a rocky start as the priest cancels last minute. Cleo asks Joel to ordain the marriage, unaware that Goldie's put the baby daddy blame on him. Her anger increases as she walks closer to Joel, a man she believes got her cousin pregnant and forced her to get an abortion. As the ceremony starts, Mercedes, never one to shy away from a fight, can't seem to control her anger… Will this be her most explosive wedding yet?